A new study of eight digital inclusion organisations in the USA strongly supports the approach taken in New Zealand by the 2020 Trust, partners, government and supporters with Computers in Homes and other 2020 initiatives. The report by Dr. Colin Rhinesmith, Assistant Professor in the School of Library and Information Studies at the University of Oklahoma, was published by the Benton Foundation, a leading US non-profit bridging philanthropy, public policy and community action. Providing low-cost broadband – Computers in Homes provides subsidised broadband to participating families, in innovative ways. We and our partners also assist with community wireless broadband connection projects such as the Kaingaroa Forest Wireless Hub. Connecting digital literacy training with relevant content and services – Computer in Homes is a school and home project connecting digital literacy training for parents with with home computers for their children’s education and communicating with teachers. KiwiSkills connects digital training with job-seeking, whilst ICDL connects training with improved, certified and portable workplace skills. Stepping UP connects digital training in libraries with accessing content and services of personal interest to participants, Living Heritage connects students local history projects with publishing on the web, and the Digital Inclusion map visually shows and links digital literacy training and other digital inclusion projects and services. Making low-cost computers available – Computers in Homes provides refurbished computers to families in low decile schools, and we work in partnership with Transpower and computer recyclers to equip learning hubs. In the past 2020 helped establish Computer Access NZ, to help the refurbishing and supply of low cost computers to schools and community organisations. Operating public access computing centers – 2020 partners with libraries, maraes and many other organisations that offer public access computing to deliver KiwiSkills, Stepping UP and Computers in Homes. Past projects like Smart Newtown helped establish centres, and Computers in Homes can help establish learning hubs, for example in marae. The report also notes the importance of citywide and regional initiatives, concerns about program sustainability, the need for outcomes-based evaluation, and the connection of digital inclusion and broader policy goals. All of these are important factors in 2020’s strategy and approach. 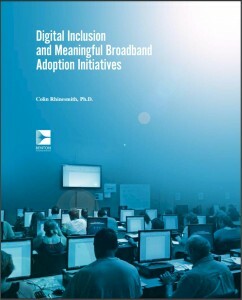 See Four Essentials for Digital Inclusion Efforts, Dr. Rhinesmith’s introduction to his research on www.benton.org.